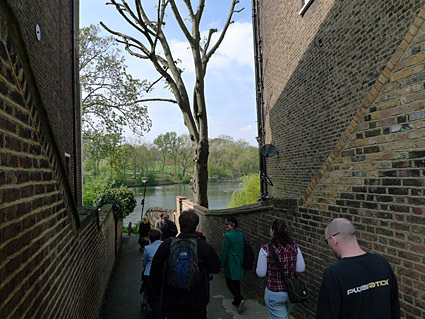 Nearly four years on from the first Hampstead Heath walk, the urban75 crew enjoyed a delightful stroll around the park in the Spring sunshine. 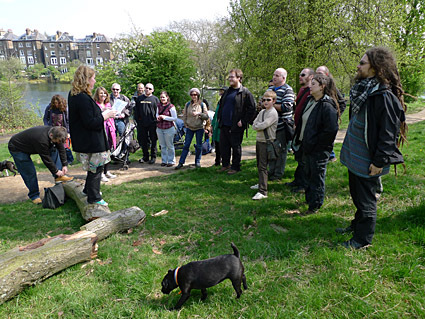 Organiser for the day trashpony kept the walkers entertained, informed and amused with a veritable volley of related facts, many of whch have been incorporated into this article. 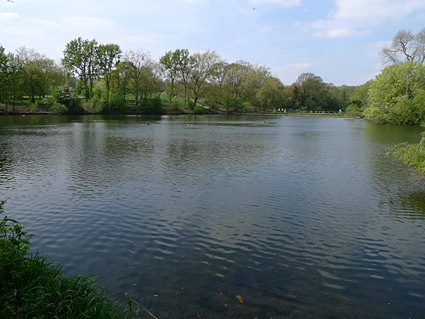 Hampstead Heath now incorporates some 790 acres, with the park reaching its current size in the middle of the 20th century. 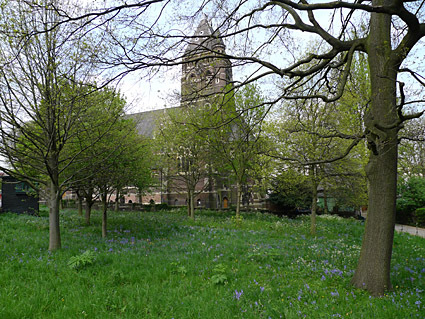 The Heath's first appearance in history books was in 986 when Ethelred the Unready granted one of his servants five hides of land at "Hemstede". 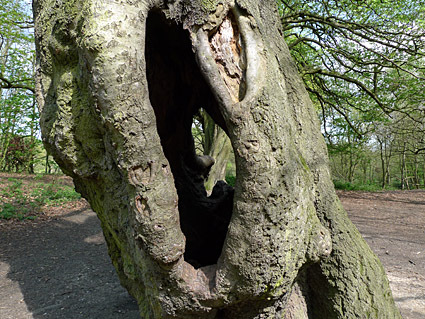 The area was known as Hampstead Heath by 1543, with its springs supplying London. Two years later hunting and hawking were forbidden over a wide area of the Heath at the command of the King who wanted to keep it all to himself. 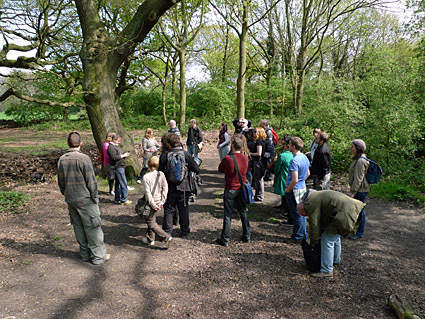 The Heath stands on a sandy ridge, running from Highgate to Hampstead, with the clay underneath first quarried in the Middle Ages. 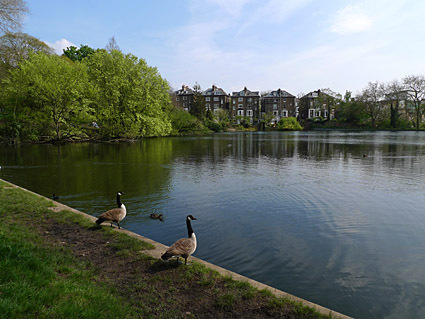 The Hampstead ponds started life as a string of reservoirs built by the Hampstead Water Company in 1692. 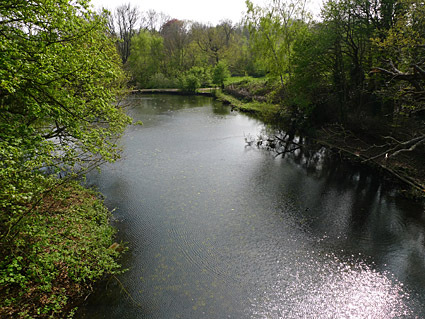 Constructed to provide water for London, the ponds were created by damming Hampstead brook - one of the sources of the Fleet - and the two 1703 ponds on Lower Heath had doubled to four by 1810. 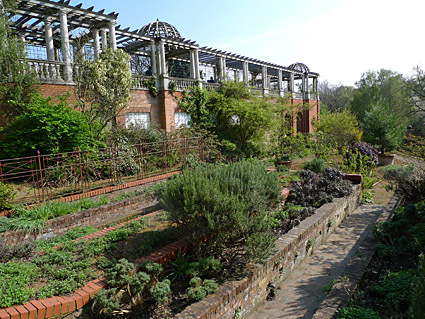 Although most of the Heath lies in Camden, it is managed by City of London, with the 100 acres of Kenwood Estate managed by English Heritage. 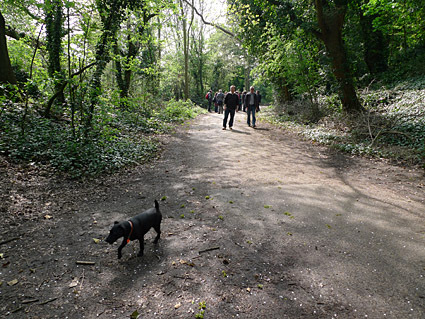 There's no direct tube station for the Heath (although Hampstead Heath and Gospel Oak rail stations stand on the southern borders), so I walked down from Belsize Park. Tragically, as soon as I saw the tube station sign, I ended up with Marillion's daft song 'Kayleigh' in my head for the walk towards the park (the song namechecks the suburb). Solid Victorian shops and houses on Pond Street. 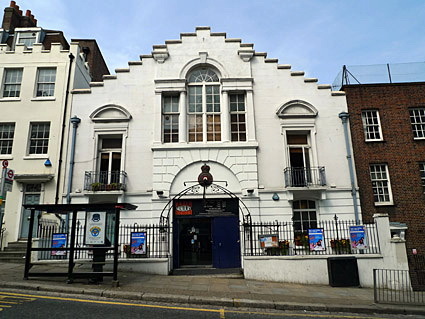 The old armoury building on Pond Street, currently a health and fitness centre. The meeting point was at the Garden Gate pub, where Liam from Oasis was spotted shuffling around the garden in a ludicrous pair of 'rock star' shoes. Bless. 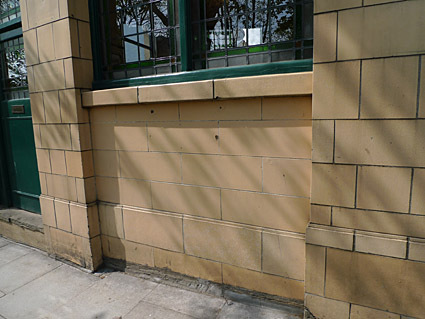 These two marks on the wall are claimed to be bullet marks made when Ruth Ellis shot her cheating lover dead in the street. After being convicted, she became the last woman in Britain to be hanged. Walking past one of the southern ponds. The first info burst is delivered! 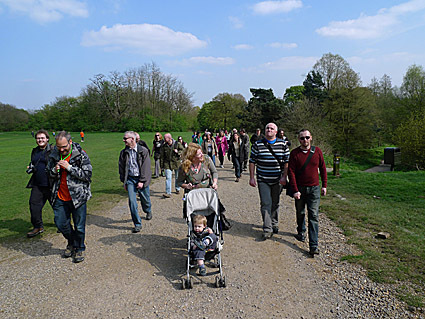 Here we learnt that Hampstead Heath was a popular day out for Londoners by the early nineteenth century, with crowds increasing after the opening of Hampstead Heath railway station in 1860. 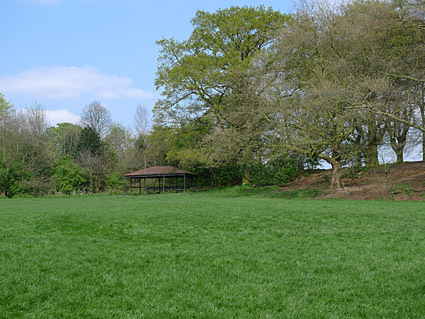 Fairgrounds have been a regular fixture on the Heath ever since Sir Thomas Maryon Wilson allocated a large site in 1865. By the 1870s they were flocking in, with up to 30,000 visitors for the August bank holidays and 50,000 on a Whit Monday. Somewhere around here is the Saxon Ditch, claimed to be the oldest human-made feature on the Heath. 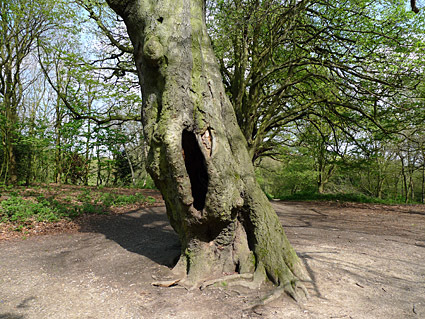 It's been here since at least AD 986 and it's surrounded by ancient trees and stones, but we weren't sure if we'd found it or not. But it's there somewhere! 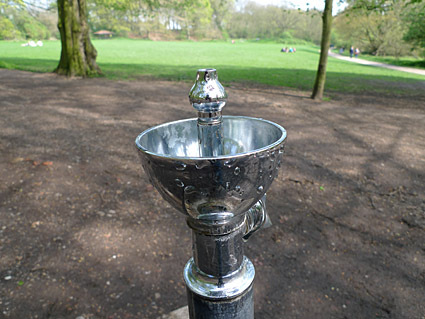 Old style water fountain - and it actually worked. 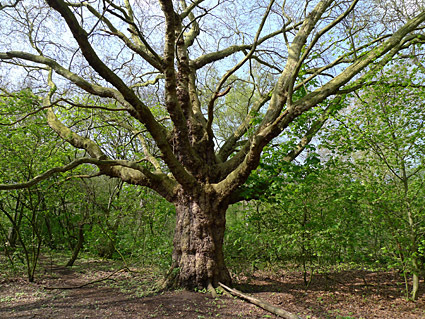 Fine old tree standing near an avenue of trees that were flattened in the famous ' hurricane' of 1987. Looking down from the viaduct bridge which was built in 1845 as part of an ill-fated housing development by Sir Thomas Maryon Wilson, then the serving Lord of the Manor of Hampstead. 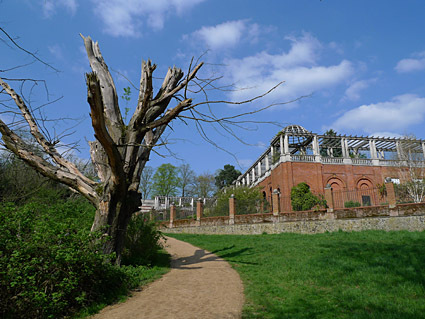 His cunning plan would have seen 28 villas constructed on a wide strip of land east of the Vale of Health and the Hampstead ponds, with the viaduct carrying the access road over a swampy valley. The swampy valley below was eventually drained to form a rather nice ornamental pond. 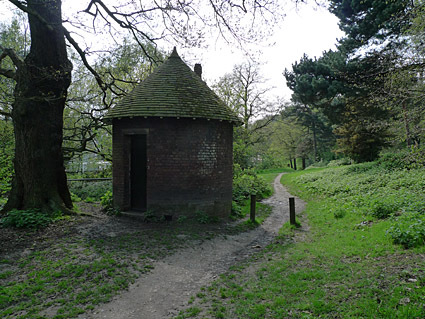 The old ice house, now a keeper's hut. 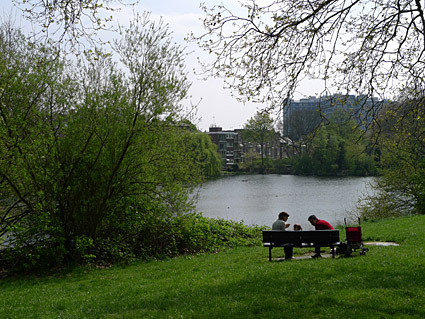 Right next to Jack Straw's Castle is the flagstaff, which marks the the summit of Hampstead Heath, which is the highest natural point in London. The flagstaff marks the site of the fire beacon that gave warning of the Spanish Armada in 1588. 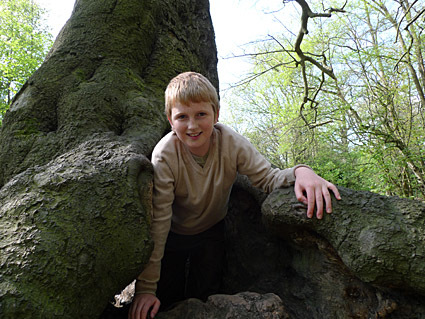 Fires have been lit over the centuries here to celebrate jubilees and other national events. 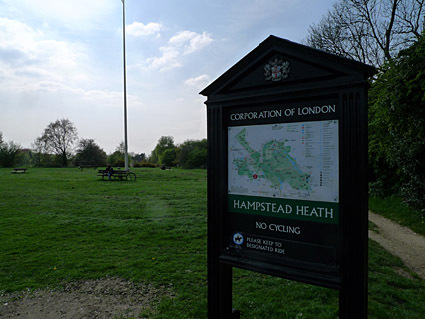 Behind the flagstaff is West Heath, which at night time becomes one of the most popular cottaging location in London. 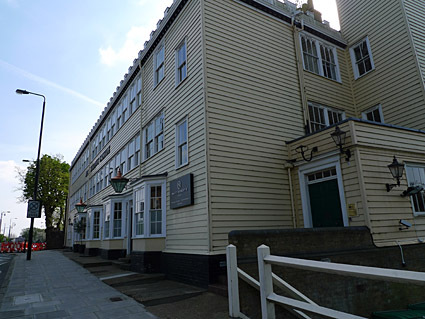 Once the the highest pub in London and an historic coaching Inn dating from 1721, Jack Straw's Castle is sadly no longer a pub. 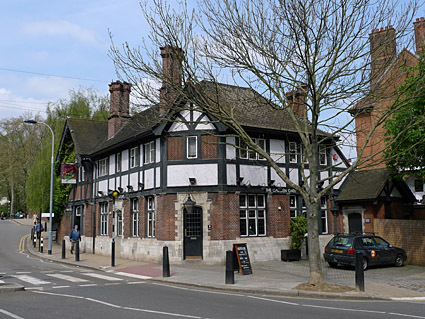 The grade II listed weather-boarded pub got its name from Jack Straw, who was a comrade of Wat Tyler (or an alias for the man himself), who led the 1381 peasants revolt against King Richard II. 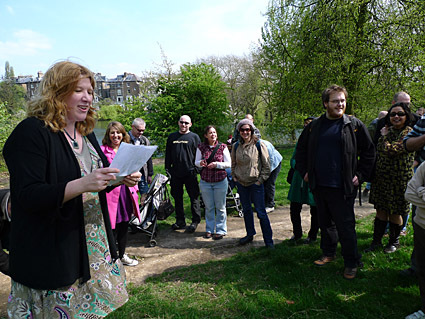 Straw addressed crowds of peasants on Hampstead Heath from a hay wagon, which was dubbed 'Jack Straw's Castle'. 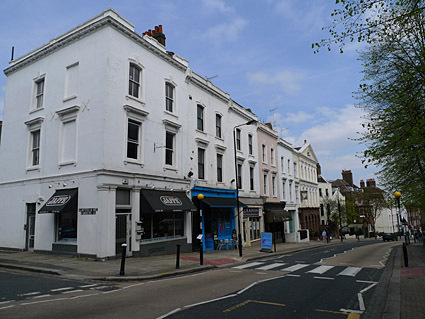 In the 19th century Wilkie Collins, William Makepeace Thackerary and Charles Dickens were known to have visited the pub, and after being extensively damaged by World War II bombing, the building was rebuilt for the second time in 1962. Walking up to the Pergola. 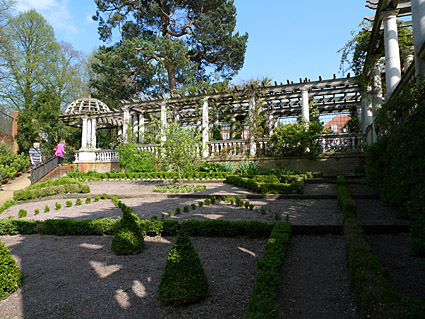 Built by Sunlight soap magnate William Lever, (later Lord Leverhulme) between 1906 and 1925, the 800ft long pergola, stands over 15ft above the level of the surrounding heath, with the earth foundations made from the spoil from the Northern Line Underground excavations. 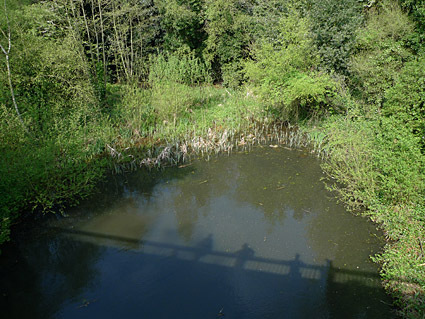 Acquired by the LCC in 1959 and restored by The Corporation of London in the early 1990s, the site is home to brown long-eared bats.